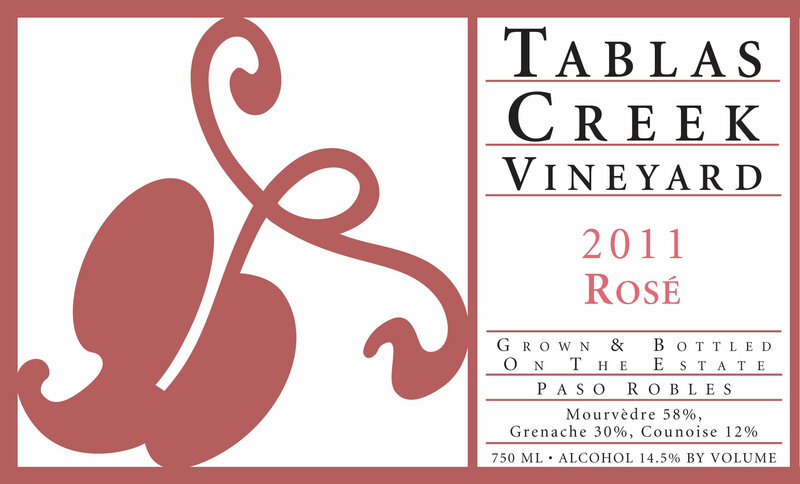 The Tablas Creek Vineyard Rosé 2011 is a blend of three estate-grown varietals, propagated from budwood cuttings from the Château de Beaucastel estate. The blend is traditional of the southern Rhône, though the blend of grapes is predominantly Mourvèdre, and therefore more like the solid, dry rosés of Bandol than the lighter Grenache-based Tavel. Our 2011 Rosé was recently one of six rosés featured in Forbes Life celebrating "the world’s sexiest beverage", and it received a 90 point rating (tied for the year's best) from the Wine Spectator. It also received 91 points and the comments "will stand toe to toe with the top rosés from France" from the Rhone Report. The 2011 Rosé is available direct from the winery and in limited national distribution. The 2011 Rosé is cranberry in color, with an expressive nose of watermelon rind, rose petals, plum, mineral and sweet spice. The mouth is rich but balanced by vibrant acids, with flavors of cherry, wild strawberry, plum and lime, and a long, rich finish that is both fresh and spicy. Pair it with Mediterranean cuisine, Spanish tapas, preparations with garlic and olive oil... or just enjoy it outside on a sunny day. Each year, we take the grapes for our Rosé from the oldest section of French-source vines at Tablas Creek. In 1994, two years after our French vines had been released from their USDA-mandated quarantine, we had propagated just enough to plant a few rows of each varietal on a hill overlooking our vine nursery. Over the next few years, we used cuttings from these plants to plant the rest of our 120-acre vineyard. These few rows of high-quality vines ripen later than the rest of the vineyard, so we harvest the Mourvèdre, Grenache, and Counoise together and co-ferment them (on their skins) in a single stainless steel fermenter. After 48 hours, we draw about 800 gallons of juice off the blend, and ferment it dry away from the skins. These lots are then supplemented with saignées (bleedings) from other Mourvèdre and Grenache lots in the cellar. The grapes for our Rosé were grown on our 120-acre certified organic estate vineyard. The 2011 vintage was our second consecutive winter with healthy rainfall, but yields were dramatically reduced by two nights of frost on April 8th and 9th, impacting particularly the early-sprouting grapes like Grenache Noir. Despite the low crop loads, ripening was slow due to a very cool summer, and harvest roughly three weeks later than normal. The long hangtime and low yields combined to produce fruit with notable richness balanced by higher than usual acidity, all at low alcohol levels -- perfect for rosé!